A Million Miles in a Thousand Years. 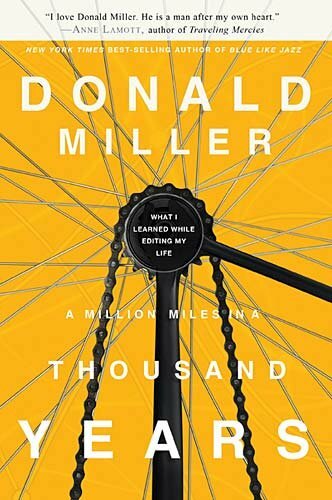 Donald Miller. I’ll tell these things to God, and he’ll laugh, I think, and he’ll remind me of the parts I forgot, the parts that were his favorites. We’ll sit and remember my story together, and then he’ll stand and put his arms around me and say, “Well done,” and that he liked my story. And my soul won’t be thirsty anymore. What if your life was a story? What if your life was a story and you were the author, or at least co-author (but main-author)? How would you change your current story? How would you make memorable scenes? How would you invite others into your story? In the book Miller discusses life as a story, and how the elements of story come together in each of our lives. We can have a captivating story, or a dull story — we choose, as we are the main author. Many of us are guilty of not changing our life story, because we have become content, or we are afraid of change. (Or both.) But should we be content with where we are today? Could greater things be in store? He didn’t discuss it much, but of course other people are part authors of our story as well. I had this revelation a few weeks ago when Kelly threw a surprise party for me on my 40th birthday, and I got to see so many people from my life — family, of course, and friends from college, friends from nearby, and friends from far, some of whom I see often, and some of whom I see rarely (these days). And they are all a a part of my life story. I have many “memorable scenes” with all of the people I saw, and there will (hopefully!) be many more. But, as the main author of our life story, we have so much to do with those scenes… What more can we do to create more and more of those scenes that stand out from the dull monotony of every day life? Not that every day needs to be an adventure of some type — there are opportunities for memorable scenes more often than we typically think. Another key point, for me, was how we choose to invite others into our stories — and how we help create memorable scenes for them. I want to be better about this. The quote I opened this post with struck me… It is from the very end of the book, and is key. Don’t we all want to hear “well done” from God on that last day, and that “He liked my story?” I can’t wait to be reminded of those parts of my story that I’ve forgotten, but that were important not just to me, but to Him.